Facebook wants to know “What’s on your mind?” Twitter asks “What’s happening?” But that’s getting old already. The burning question for the next wave of social networking is “Where are you?”--and services like Foursquare, Gowalla, Brightkite, and Loopt want you to use your smartphone to answer it. As long as the sky is fairly clear, the geolocation app on your phone can ascertain your position reasonably accurately. Indoors, however, it’s less accurate, and in locales where storefronts are in very close proximity, you may have to select your location manually from within the app interface.Eventually, though, more-advanced A-GPS systems should increase the accuracy of geolocation positioning inside buildings. Several start-up companies offer geolocation services--and some, such as Foursquare, reach hundreds of thousands of users. Not only do these services let you share your location with your friends, but they also bring a social gaming element to the table. Let’s have a look at some of them. 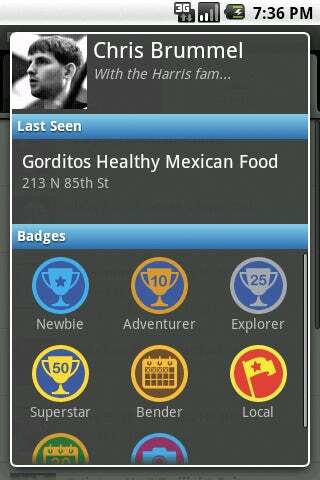 Foursquare works with iPhone, Android, BlackBerry, and Palm (WebOS) phones. If no app exists for your smartphone, you can always use the Foursquare mobile Website instead. 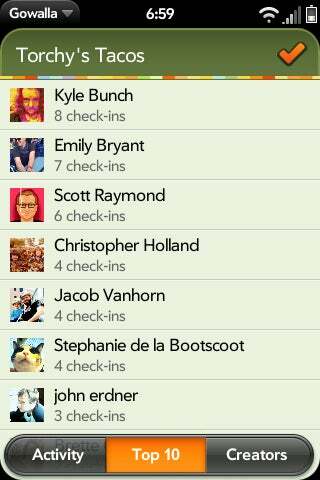 Foursquare refers to announcing your location--and thus telling your friends where they can find you--as “checking in." 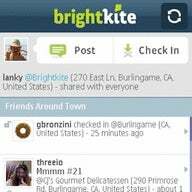 Brightkite on a Nokia Symbian phone shows a list of nearby friends and their statuses. Image: Brightkite.